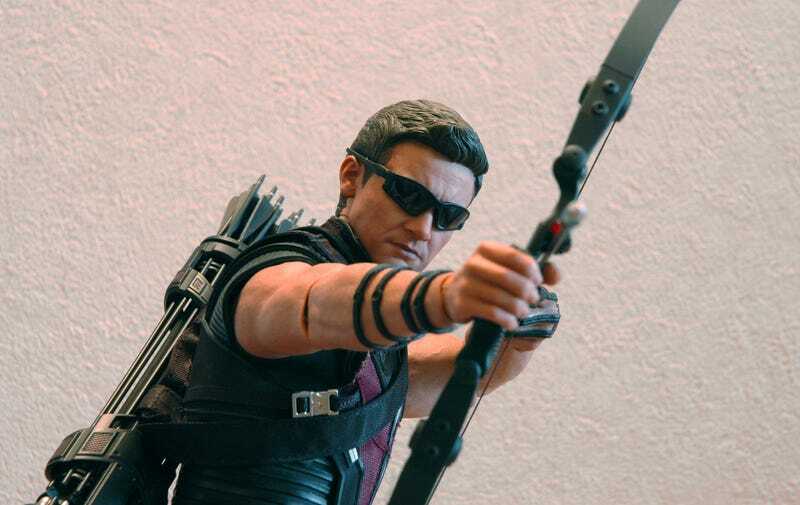 Adding to their long list of pretty amazing look-alike figures, Hong Kong collectible company Hot Toys has recently released the underappreciated archer, Hawkeye, to their Avengers lineup of the 6-inch Movie Masterpiece collection. The figure was originally slated for a September release, but was delayed until late October. Was it worth the wait? I've always been a fan of the Hot Toys collection for their attention to detail and unnecessary meticulousness-though not a fan of their price tag… This figure, for example, cost me 19,800 yen ($247.38). Hot Toys have a tendency to go all out where most makers would cut corners, and this time around is no different. As 6-inch figures go, the peripherals are somewhat slim pickings, but the detail to each is pretty spectacular. The figure comes with interchangeable hands, 2 bows (one expanded with string and one collapsible without string) sunglasses, quiver, 16 arrows, and 11 arrow tips. The face likeness, which is a huge selling point for Hot Toys, is fairly spot on. It's not 100% but it's close enough-unlike the previous Captain America. It's also quite lifelike, so you probably don't want to display this figure on your night stand and have it watch you while you sleep. In terms of flaws, most people are probably going to complain about the visible joints, but honestly, I think Hot Toys has done the best they could with a sleeveless character. My only real complaint would the lack of shoulder mobility. The character's shoulders are fixed in a relaxed position which kind of makes the most dramatic poses (you know, like when he's drawing his bow) lose a lot of their tension depending on the angle. Another problem that many people may encounter is actually inserting the arrows into the quiver. The position of the arrows in Hawkeye's quiver is fixed (due to the nature of the interchangeable arrow tips as seen in the movie) and the figure's quiver has holes where the arrows are inserted and slots to hold them in place. The problem comes in that most of the arrows are not going to want to simply slide into the slots and forcing them can cause arrows to bend or break. I had to use tweezers and a thin metal rod to get all the arrows in place, and once they were in, I sure as hell didn't want to take them back out again (Well, maybe just one for posing purposes). As stated previously, Hawkeye was originally scheduled to be released in September, but was delayed for a month. This isn't the first time that a figure has been delayed, and Hot Toys has posted a Q&A on their site on which the issue is brought up quite directly. When asked "Why do you have repeated delays? As a business, don't you feel the slightest bit of shame in being unable to meet the release dates of many of your products? Couldn't you figure out some sort of system, like waiting until you were sure before announcing a date?" Hot Toys responded that making the figures is "very complex and difficult" process, requiring artisans, copyrights, and even supervision from the actors. "Often the choice comes down to releasing on the designated date, or delaying the release in order to offer an ideal quality product to our customers," the figure maker explained. "Hot Toys chooses the latter option. We understand that this decision will cause problems. However, meeting release dates while maintaining a satisfactory quality still requires a great deal of time. We ask that our customers understand this." Considering how happy I am with my Hawkeye, yeah, I can stand the wait. The figure costs $190. It's currently sold out, and there's a waiting list.